More visual design chops. Data visualisation FTW. To doff our hats in the direction of Nate Silver / Freakonomics and get better at creating compelling stories out of facts and figures. Data journalism wins too! To fully understand what makes the audience tick. To gather feedback and react to it. Promptly. To dive headfirst into our analytics tools to make sense of what works, and what doesn’t. To constantly tweak our tactics. Teams that support one another, and to work with other people across the business. We also need technology platforms that support content teams, for content can only go so far. With that in mind, here it is. I cobbled it together yesterday afternoon. As a first pass I think it works, but it probably needs to be finessed. Click on the image for a bigger, clearer version. Start reading from the top left (‘Direction’), and then proceed clockwise. Broadly speaking, the cycle is along the lines of: Leadership > Insight > Execution > Feedback. Test, refine, repeat! I have been very liberal with regards to the naming of the roles. These are broad descriptions, rather than prescriptive job titles. For example, you would probably want to replace ‘Listener’ with ‘Chief Listening Officer’, or something similar. 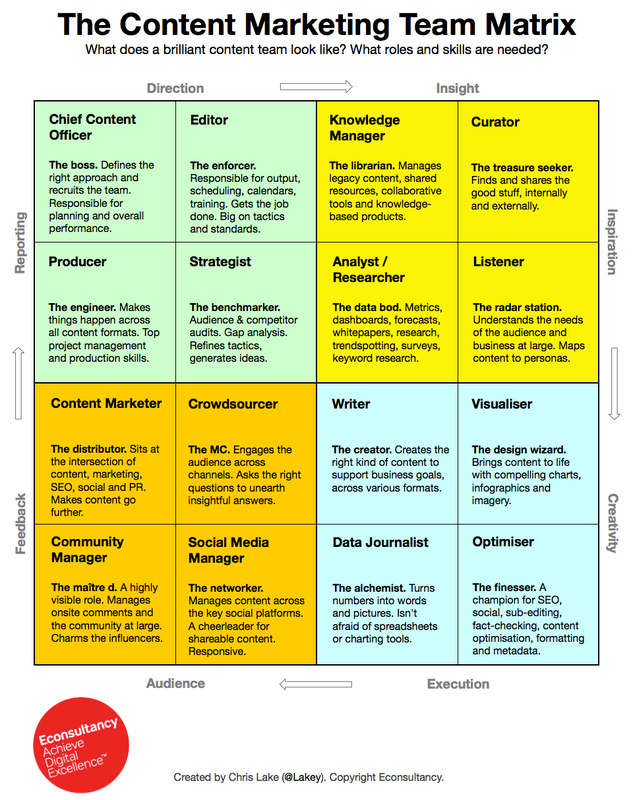 You could swap ‘Chief Content Officer’ for ‘Content Director’. ‘Writer’ might be ‘Blogger’, or ‘Journalist’, or ‘Reporter’, or something else. Skills matter more than the roles, per se. Multiskilled teams will cover off many of these 16 roles. That’s exactly the way it should be, and it’s how our small team operates. Writers with strong maths and design skills won’t be short of work in the years to come. There is a lot of flexibility and overlap in the various sections. Take the top right section: the analyst / researcher role might be a content producer, or an internally-focused analyst. It depends on your needs as a business, and the approach you take. Some roles such as ‘copywriter’ are possibly AWOL. I think ‘Writer’ covers that one, but there may be others that didn’t make the cut, or that I missed. Do shout up if you think others should be added (or roles replaced). I have purposefully avoided certain roles, notably tech and HR, which I think are largely support roles that exist within other parts of the organisation. I don’t think these merit dedicated content roles for most businesses. If you hire a bunch of ‘Content Technologists’ to sit on your content team then I suspect your tech is too complicated, or the skills on your team aren’t developed enough. Does it make sense? Is this kind of structure an accurate reflection of what’s needed? What would you change? Do let me know what you think in the comments area below, or via Twitter. PS – remember to book your place for the 2014 Festival of Marketing, which takes place in November. It is a two day celebration of the modern marketing industry featuring speakers from brands including LEGO, Tesco, Barclays, FT.com and more. 5,000 of your peers will be there. Is it dawn of the dead for official movie websites? The very first experience of the internet I ever had was visiting an official movie website. It looked exactly as you’d imagine. A static image of Austin Powers with whatever character Liz Hurley played in it (again this was 1997), along with a couple of Flash enabled games, a few still images and the odd ‘high quality’ screensaver. I doubt there was a trailer. If there was, it would have taken three hours to load.